The Styles feature allows you to define a set of properties of an object, that can be reused across your team's designs. You can use Styles to define the Color, Text and any Effects applied to objects; or to define the structure and appearance of Layout Grids. Whenever you make a change to a Style's properties, like updating the text color from red to blue, any objects using that Style will be instantly updated. Like Components, Styles can be shared by publishing them to your Team Library. This allows you to easily establish and maintain consistent styles across your team projects. Learn more about when to use Styles in our blog post: Best practices: components, styles, and shared libraries. Color Styles (Including Gradient Styles). Share Styles with your Team. Check out the video below, or read on to learn more! You can create a Style from an existing object. This will allow you to save some of those properties applied to an object as a Style, so you can reuse it on other objects. Color styles can be applied to Fills, Strokes and Text in your designs. You can even create Color Styles for Gradients. Select the object you'd like to create a style for. In the Properties Panel, click the Show styles icon (the four dots arranged in a square) next to the property you would like to save. Tip! For Color Styles, this would be either the Fill or Stroke property. 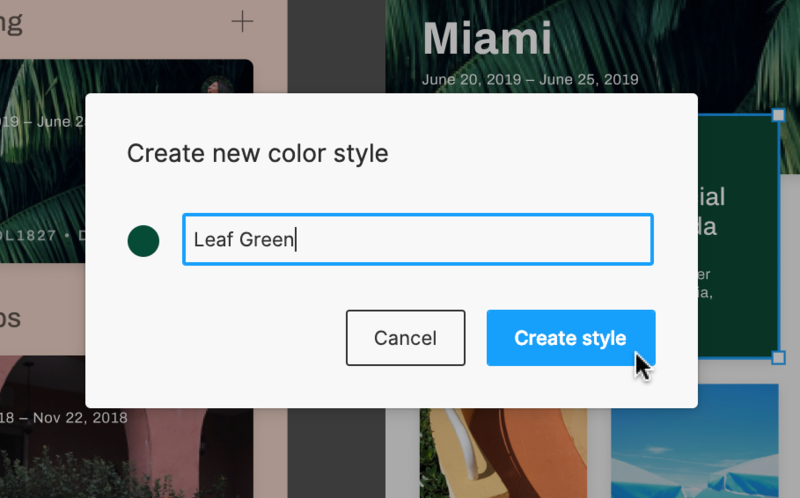 Click the Create Style button to save the Style. Tip! We recommend naming Styles based on how you will use them in your designs, vs simply using the color as the name. To make finding and selecting styles easier, you can also organize your styles into groups by naming them with a slash naming convention. In the Styles menu, you will see your Local Styles and any Styles shared via the Team Library. Styles will be ordered alphabetically by Team name, then File name. For example: to group all of your Text Color Styles together, you would name them Text/Purple, Text/Green, Text/Blue etc. 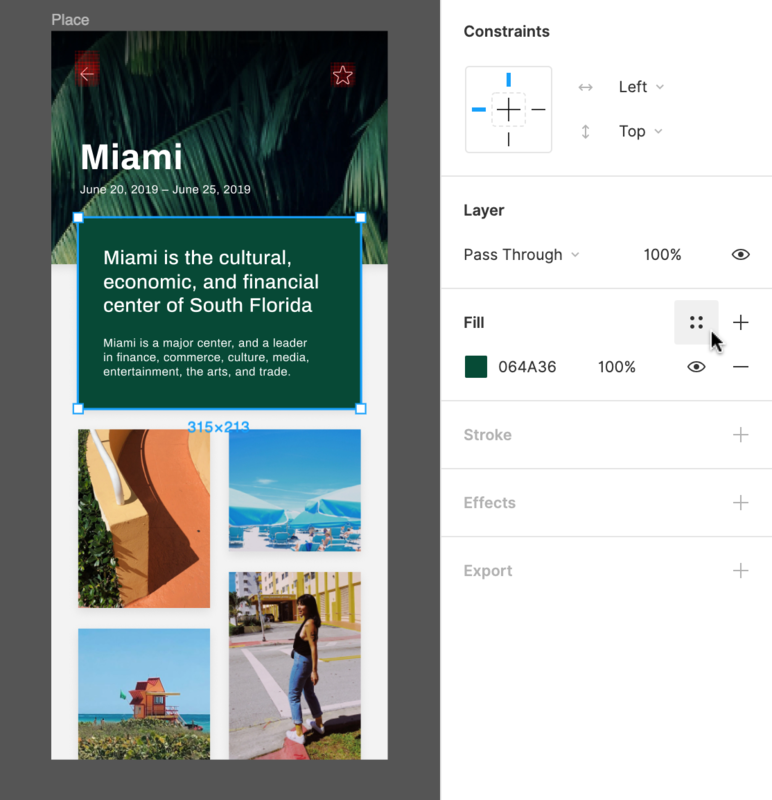 Figma will then display those Color Styles together, under a "Text" heading. Styles can also be applied to Text. This is great when you want to set different properties for different blocks of text. You can apply a Text Style to an entire block of text, or apply it to just some of the text within a block. This is perfect for defining the style of your headers (e.g. h1, h2, h3) and body text; as well as determining how to style text within a paragraph (e.g. links). Select the Text you’d like to create a Style for. 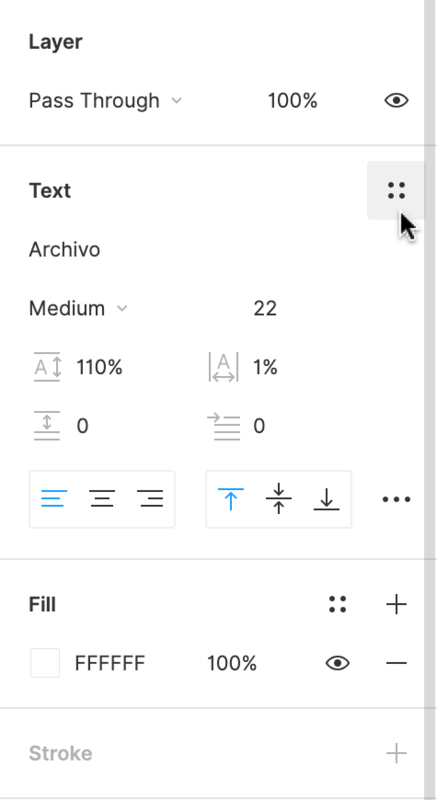 Click the "+" icon in the Text Styles menu. Set a name for the Text Style. Click Create Style to complete the process. Tip! Text alignment can't be set using a Text Style. You will need to set the alignment of each text block individually. You can also create Styles for Effects, like Inner Shadows or Drop Shadows. Select the object(s) you’d like to create a Style for. If you haven’t already, add any Effects you’d like to save, to the object(s). 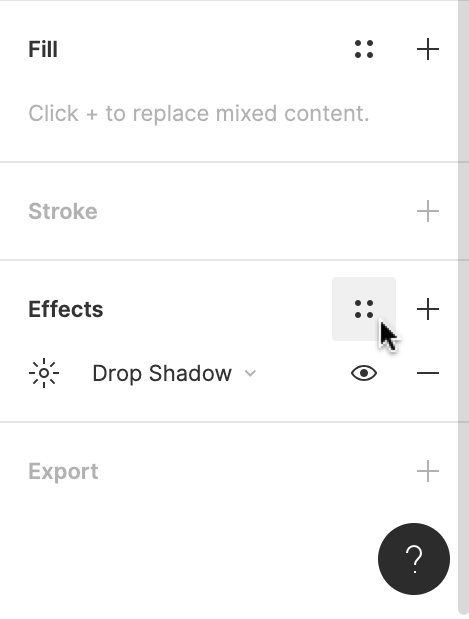 Click the "+" icon in the Effect Styles menu. Set a name for the Effects Style. Tip! You can create Styles for objects with multiple Effects applied and all Effects will be included in the final Style. For example: If you have multiple properties applied to an object (e.g. two Drop Shadow Effects and an Inner Shadow), then all of those properties will be saved to the Effect Style. Lastly, we can create Styles for Layout Grids. This is particularly useful if you’re wanting to replicate a specific format or structure across multiple designs. Create (or select) a Frame in the canvas. 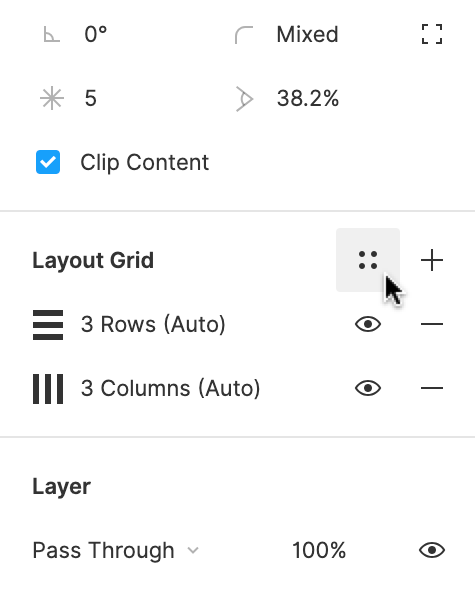 In the Properties Panel, add a Layout Grid to the Frame. 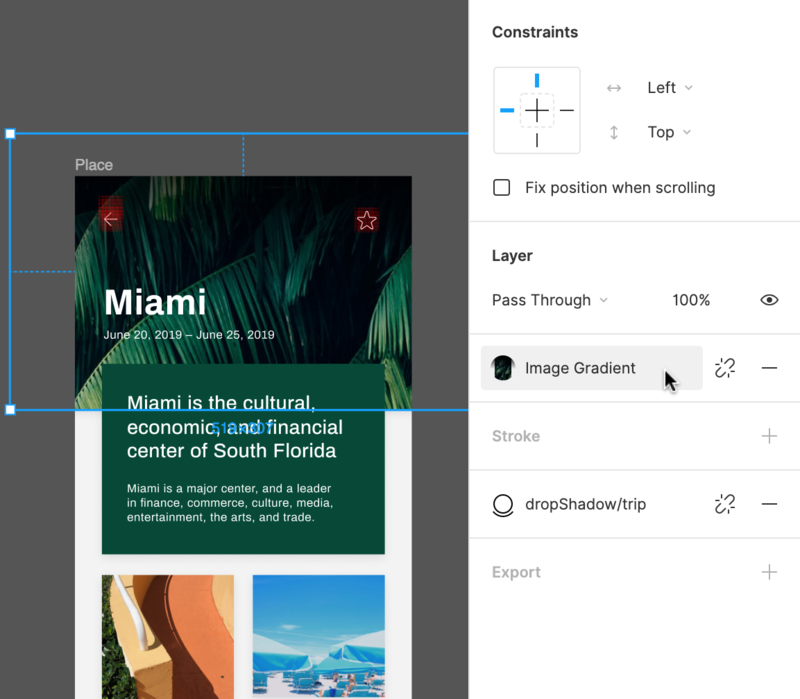 Update the Layout Grid to match the properties you’re wanting to save to a Style. Learn more about Layout Grids. Set a name for the Layout Grid Style. You can share Styles with your team, or make them accessible from other Files and Projects, by publishing them to your Team Library. Learn more about sharing Styles in our Managing and Sharing Styles guide (see below).